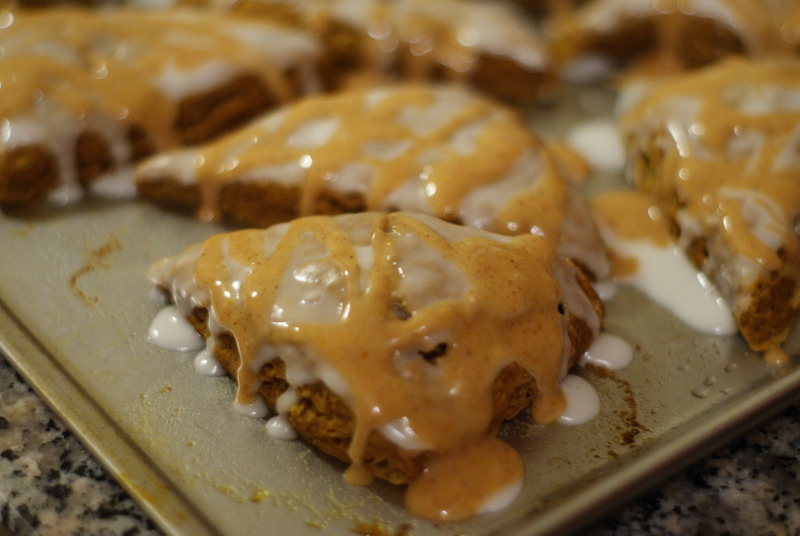 Day 21: Spiced Pumpkin Scones. I made a mistake when scheduling this month. The mistake was putting Scones today. Because both Sarah and I were quite busy today, the scones couldn’t be made until late evening. I am writing this and it is nearing 9pm and the scones are still in the oven, tantalizing me with their wonderful smell. They have yet to be baked fully. They have yet to be cooled. They have yet to be glazed. What I am saying is, I do not know if they will be ready before I go to bed. Maybe I will eat one before bedtime. OK, probably I will eat some before bedtime. But that is still a ways away. At least I can look forward to a delicious breakfast tomorrow morning. Heat oven to 400 degrees F (200 degrees C) then line a large baking sheet or two small baking sheets with parchment paper (you can also spray with non-stick cooking spray if you do not have parchment paper). In a large bowl, whisk the flour, brown sugar, baking powder, baking soda, salt and all the spices together (cinnamon, ginger, clove and nutmeg). Then, cut the cold butter into small cubes (it is very important that the butter is cold for this). Add butter to flour mixture then use two knives or a pastry cutter to “cut” the butter into the flour mixture – this should take about 5 minutes by hand. By the end, the mixture should look like coarse cornmeal or crumbs. (You could also use a food processor for this – if using, add flour mixture to bowl of a food processor then add the cold butter cubes. Pulse three to four times until the mixture looks like coarse cornmeal or crumbs). Now, in another medium bowl, whisk together the pumpkin puree, molasses, half and half, vanilla extract and egg until blended. Stir pumpkin mixture into flour and butter mixture with a spoon just until a soft dough forms. Then, pat or use a rolling-pin to roll the dough into a 10 inch by 7 inch rectangle. Use a knife or pizza cutter (pizza cutter works best) to cut the rectangle in half lengthwise then cut into 4 even pieces crosswise, making eight rectangles. Now, cut each rectangle into two triangles. Transfer scones to the prepared baking sheet(s) then bake 10 to 15 minutes or until golden brown and a toothpick inserted into the middle comes out clean. Transfer to a wire rack to cool completely. Once scones have cooled, make the glazes. To make the simple sugar glaze, add sifted powdered sugar to a medium bowl then add one tablespoon of half and half. Stir then judge the consistency. If when you pick a spoon up and out of the glaze it slowly drizzles back into the glaze, it is fine. If it is too thick, add a little more half and half (a little goes a long way, here). If it is too thin, add a little more powdered sugar. Dip each cooled scone directly into the glaze then place glazed side up back onto the cooling rack. Next, make the pumpkin spiced glaze. Combine sifted powdered sugar, pumpkin puree, spices (cinnamon, cloves and nutmeg), and then add one tablespoon of half and half. Stir and check consistency. Adjust the same way as you would the simple glaze. 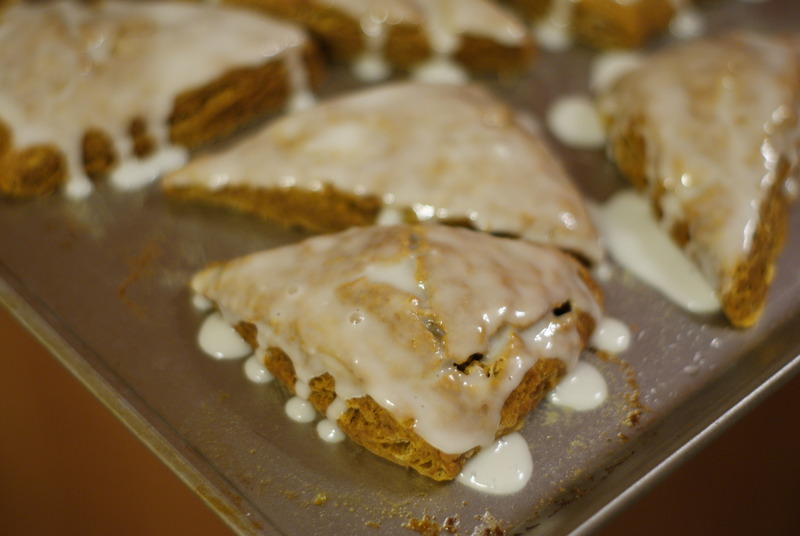 Use a spoon to drizzle a zig zag pattern across each scone. Wait about 15 minutes until the glaze has set then enjoy! I tried them before turning in for the night. Yeah, they are good. Real good. The Scone itself has a good spiced flavor and the glazes are sufficiently sweet. The only issue we have is that they are not as hard as we like are scones. 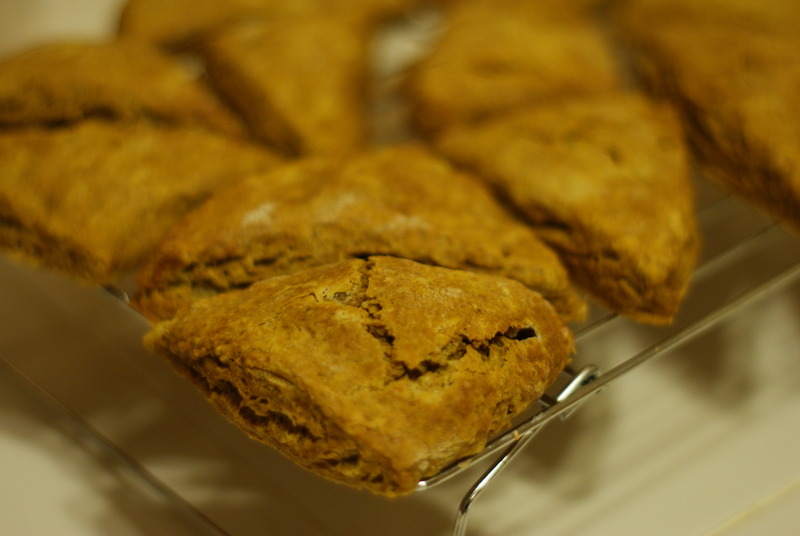 They are moist and soft which is great but not the qualities we look for in a scone. Still, I will love them again in the morning.